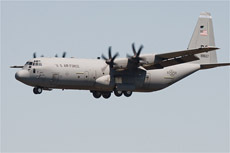 On Monday, June 27, 2011, there was a visit to Ramstein Air Base in Germany on the program. 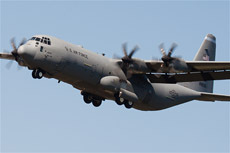 Many airlift flights from and to this huge air base take place on a daily basis. 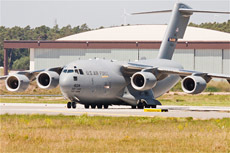 The C-5 Galaxy is a regular visitor to Ramstein Air Base. 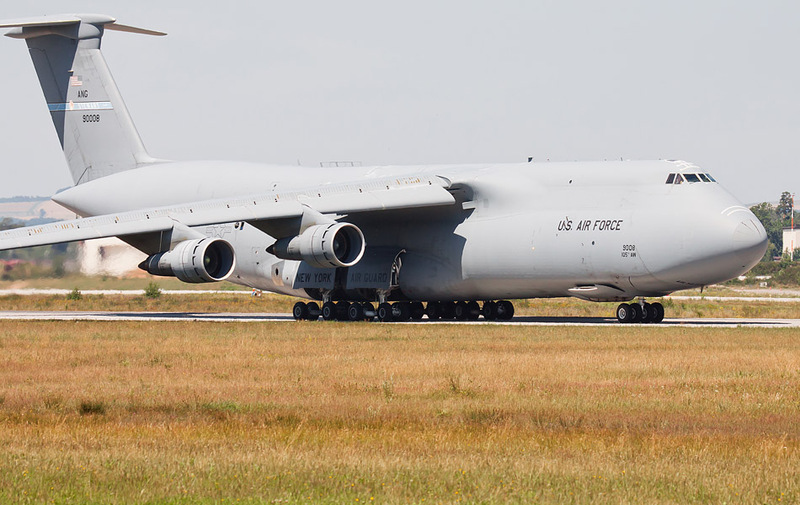 The C-5 of the USAF is currently undergoing a modernization program. 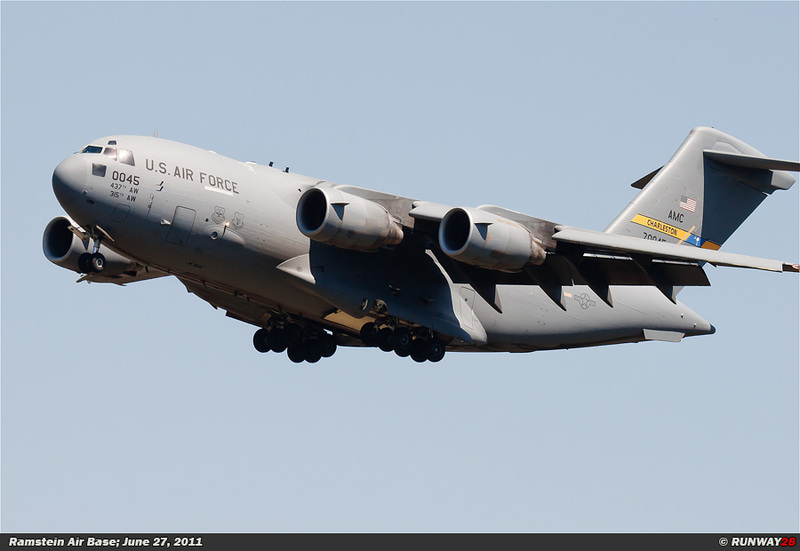 The Lockheed C-5 Galaxy is a large military transport aircraft which was built by Lockheed. 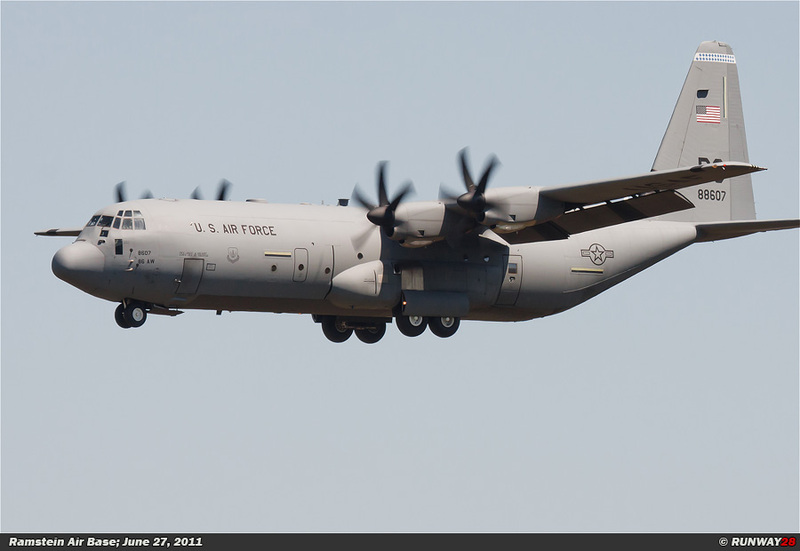 The aircraft was designed as a strategic heavy transport aircraft. The Galaxy should be able to move heavy loads and loads of big volume at intercontinental flights. The C-5 Galaxy is used by the United States Air Force (USAF) since 1969 and is one of the largest military aircraft in the world. 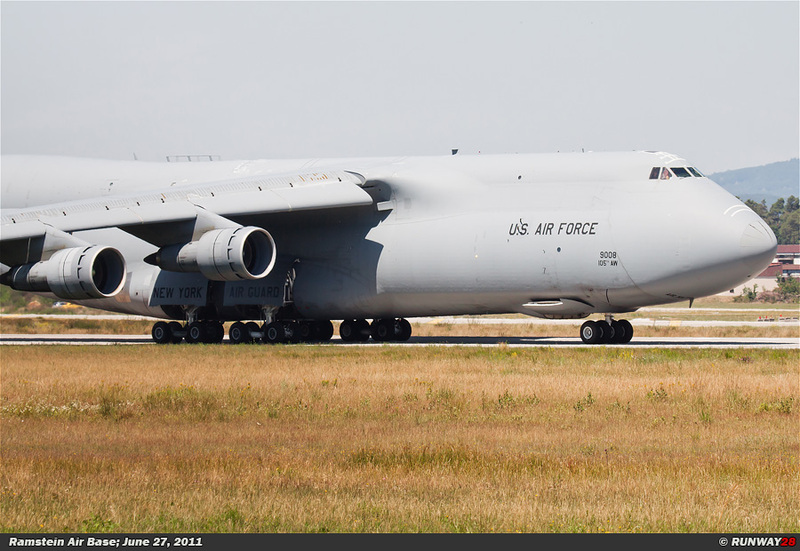 The C-5M Super Galaxy is an improved version with new engines and modernized avionics. This model will extend the life of this gigantic aircraft until after 2040. Next to the C-5M there were 3 variants developed in the past, namely; the C-5A, the C-5B and C-5C. The C-5A is the original design of this aircraft type. This aircraft was built in the period from 1969 until 1973. In total 81 C-5A aircraft were delivered to the USAF during that period. The maximum take-off weight of the aircraft was reduced as a result of cracks in the wings in the 70s. A completely new wing design was introduced to get the plane fully operational. 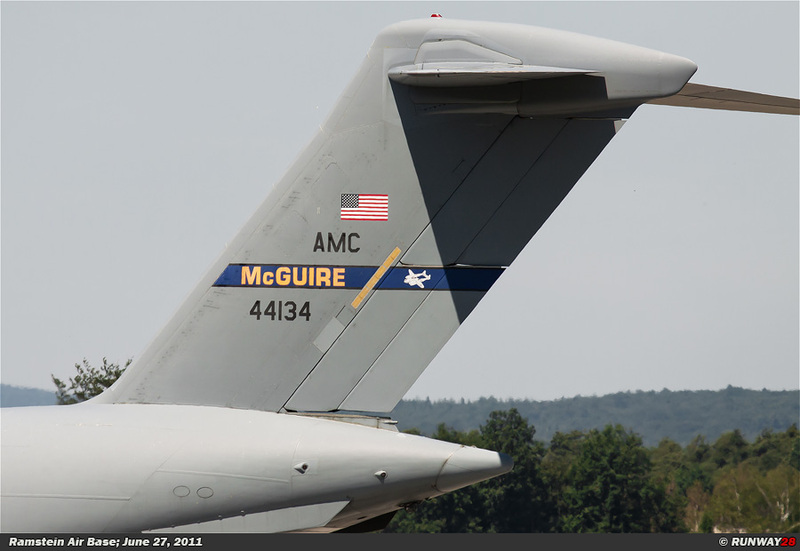 A program was started in 1981 to update 77 C-5A aircraft with the new wing design. The program ended in 1987. 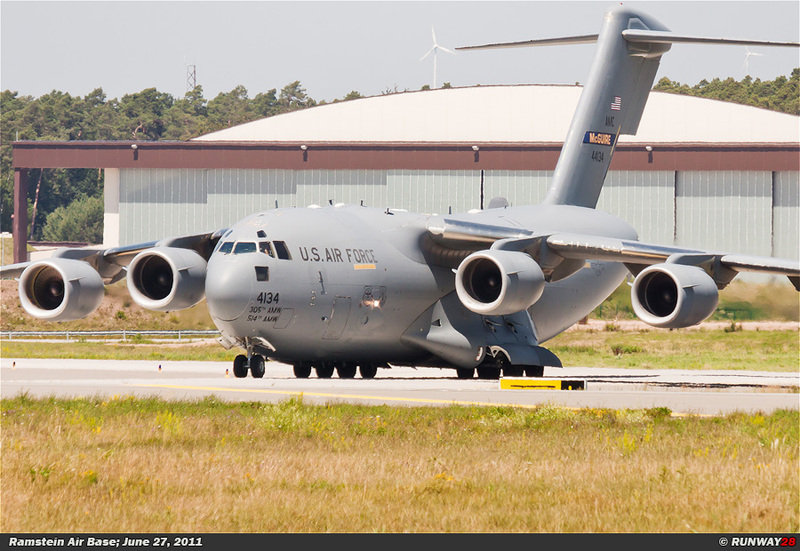 The new wing is constructed with a new aluminum alloy which did not exist at the moment of the production of the C-5A. A few aircraft from the C-5A series is already returned from service due to the high age of the airframes. A few more C-5s are on the list to be written off in the near future. These aircraft are currently based at Wright-Patterson AFB in Ohio and Stewart ANGB in New York. The aircraft will be replaced by the C-17 Globemaster III in the next few years. The C-5B is an improved version of the C-5A. 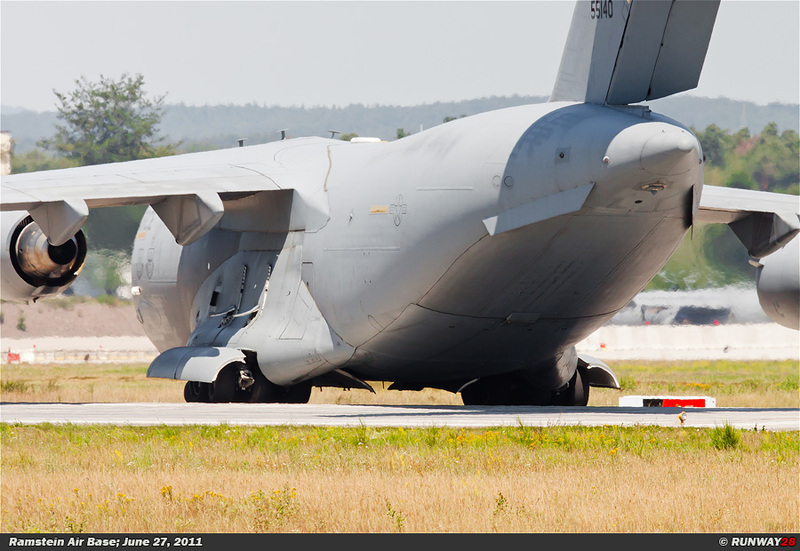 Any changes which were made to the C-5A, like the wings for example, are standardly processed in the C-5B. The aircraft has also been upgraded with improved TF-39-GE-1C turbofan engines and improved avionics. 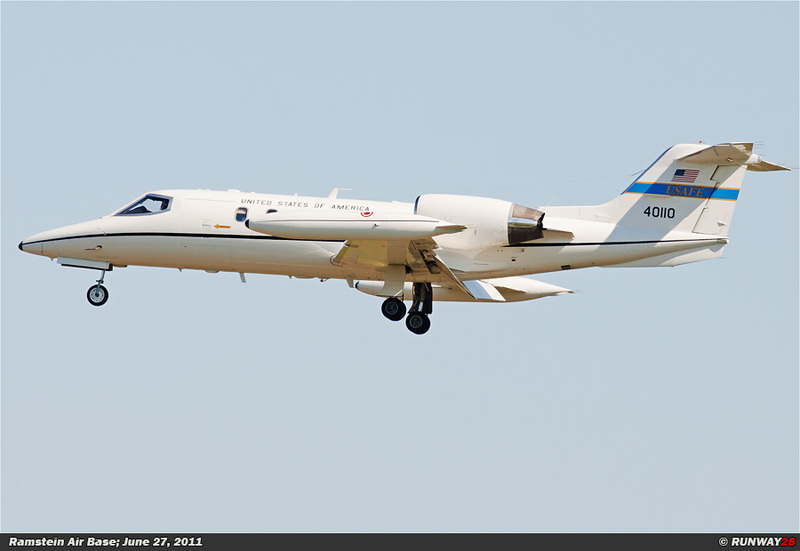 50 C-5B aircraft were delivered to the USAF in the period from 1986 to 1989.
for transporting cargos of NASA such as satellites. The main changes are the removal of the rear passenger compartment, splitting the rear cargo door and installing a new movable bulkhead which is placed further to the back. Also, a second power connector was installed. This can be used for conditioning the load on the ground platform when the engines are shut down. 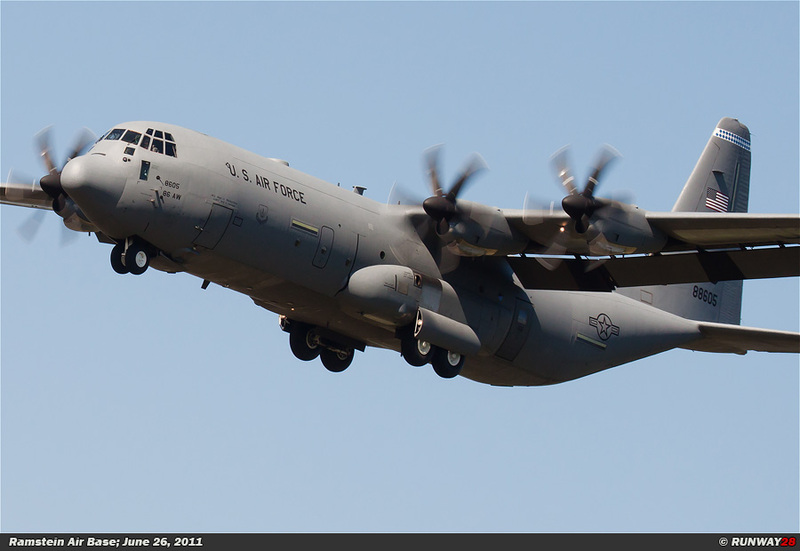 The 2 C-5Cs are flown by crews of the USAF and are mainly used by NASA. 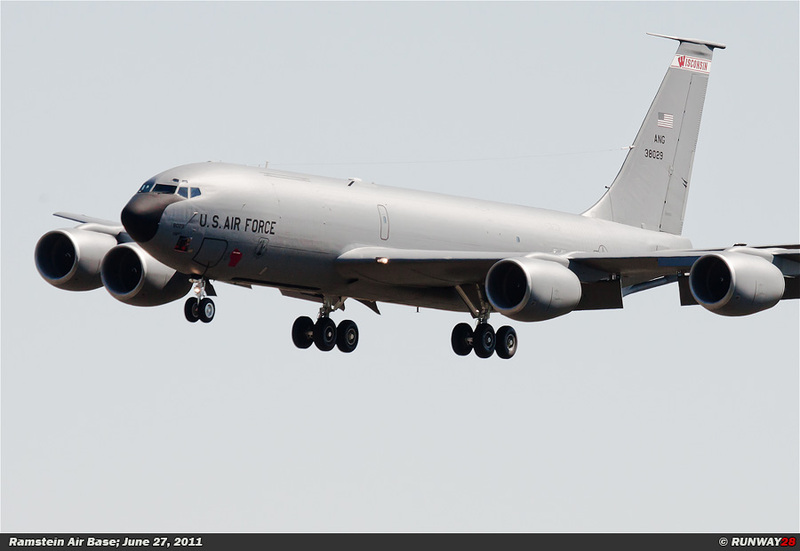 The 2 aircraft are stationed at Travis AFB in California. 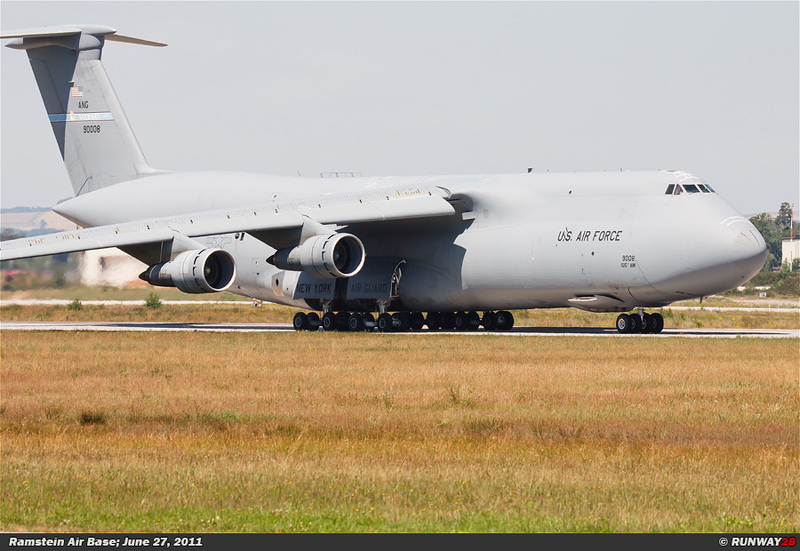 The current program will update the C-5B Galaxy to the C-5M Super Galaxy. An intensive program was launched to update all the C-5B and C-5C aircraft and part of the older C-5A fleet to the C-5M standard. 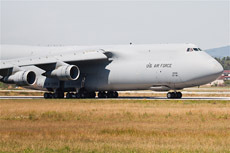 The C-5 Avionics Modernization Program (AMP) started in 1998 and included upgrading the avionics of the aircraft to the Global Air Traffic Management standard. During the update the aircraft receives a whole new glass cockpit and also the communication and safety equipment will be replaced by better and safer systems. The first flight of the first modified C-5 with AMP avionics took place on December 21, 2002. Another part of the renewal is to improve the reliability of the engines through the Reliability Enhancement and Re-engine Program (RERP). 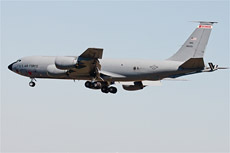 The aircraft receives 4 new General Electric CF6-80C2 engines during this program. The aircraft has therefore an improved cargo capacity and it will fly more fuel efficiently. A total of 52 aircraft will be updated to this standard. 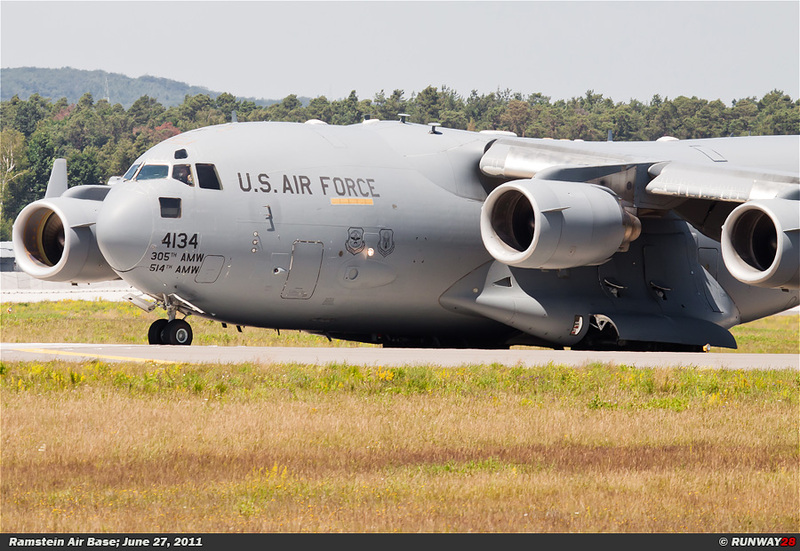 The new aircraft is designated as the C-5M Super Galaxy. Also today the weather was good at Ramstein Air Base. Again the sun was shining bright and it promised again to be a hot day. 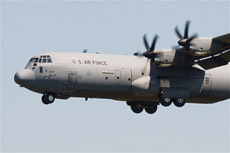 The based Hercules aircraft started flying early today. 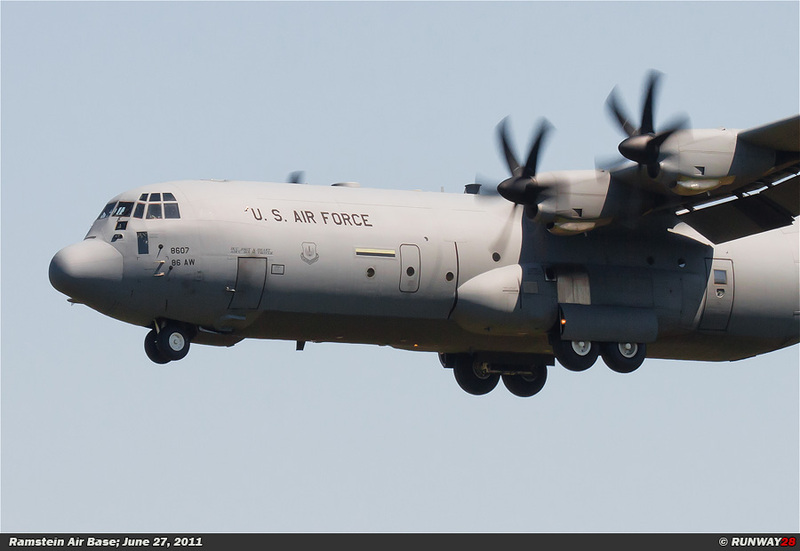 It was the first time for me to capture one of the new C-130J Hercules from the 86th Airlift Wing. This aircraft started to fly circuits which lasted the complete morning. 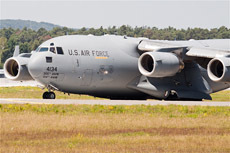 The first aircraft which left Ramstein AB today was a C-17A of the 437th AW from the Charleston Air Base in America. 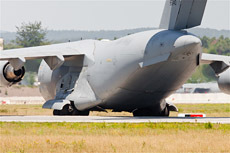 The C-17 was waiting on the taxi track at the head of the runway before it would leave. The Hercules which left earlier was at this time in the circuit. 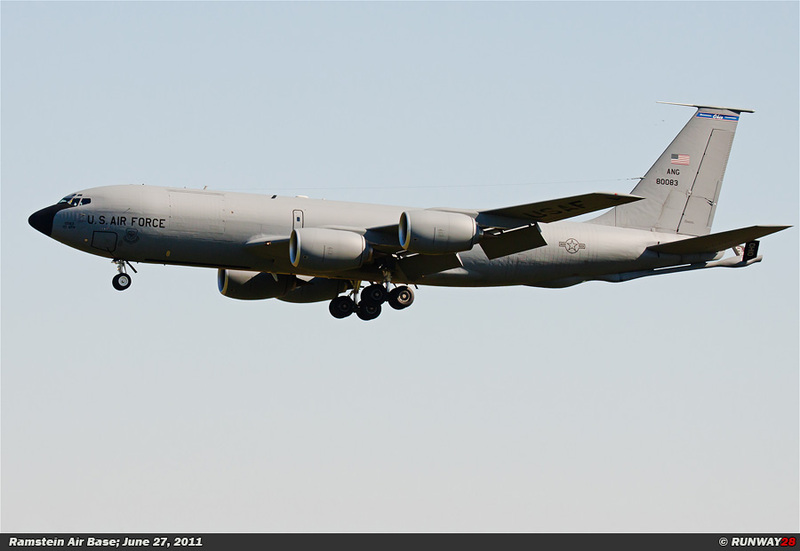 It was the morning of the tankers, because 2 KC-135 tankers arrived in a very short period. 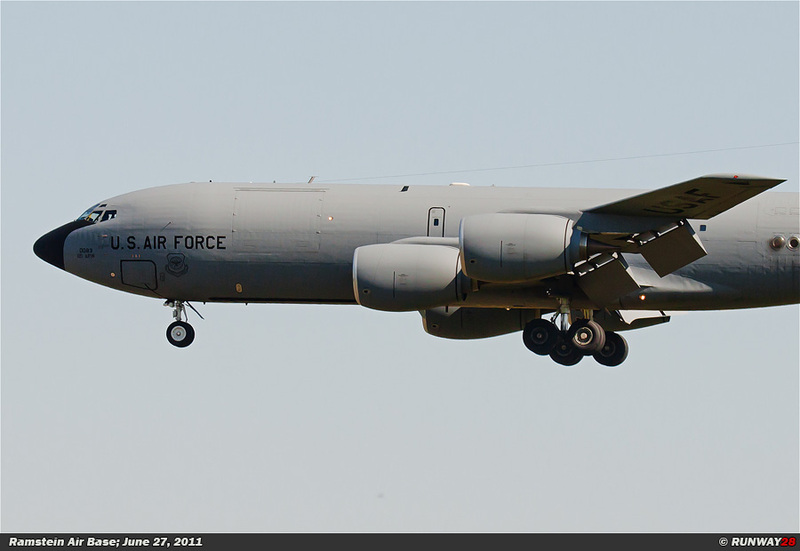 The first tanker which landed was from the Ohio Air National Guard (ANG). 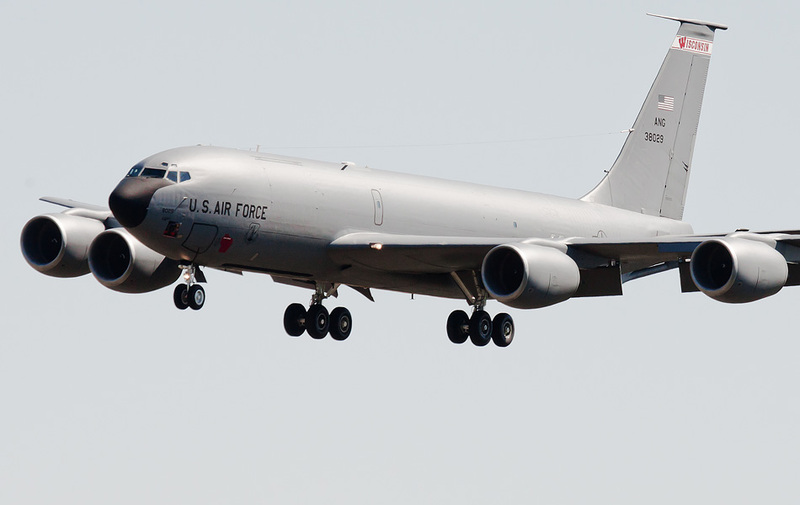 The tanker was assigned to the 121st Air Refuelling Wing and is based on Rickenbacker ANGB. The aircraft of this unit are identified by the blue tail band. 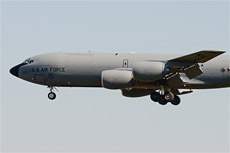 The second tanker which arrived was from the Wisconsin Air National Guard. This KC-135 was assigned to the 128th Air Refuelling Wing. This unit is based at General Mitchell IAP and is recognized by the red and white tail band. Another McGuire C-17 left after the landing of the 2 ANG tankers. The Hercules from Ramstein was still flying circuits at the same moment. Also a C-21 taxied to the runway. This small aircraft went out for a local mission and would return later in the morning at Ramstein. The most beautiful plane in the morning was now about to leave. The huge C-5 Galaxy taxied to the runway on the opposite side of the runway. The aircraft turned towards the runway via the second taxi track. The Galaxy made a back track on the runway and turned into the right direction in front of my lens. 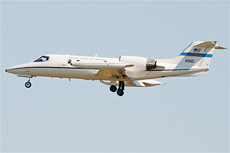 The aircraft was assigned to the New York ANG and it was from Stewart IAP. The aircraft of the 105th AW are identified by their light blue tail bands. 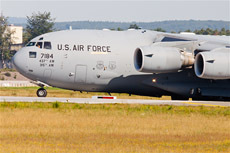 A C-17 landed at Ramstein AB shortly after the departure of the C-5. It was a C-17 from Charleston. 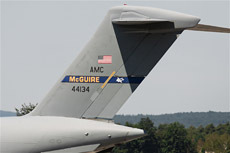 A McGuire C-17 appeared at the head of the runway shortly after the landing of the C-17. This aircraft was assigned to the 306th AW and is recognized by the yellow and blue tail band. 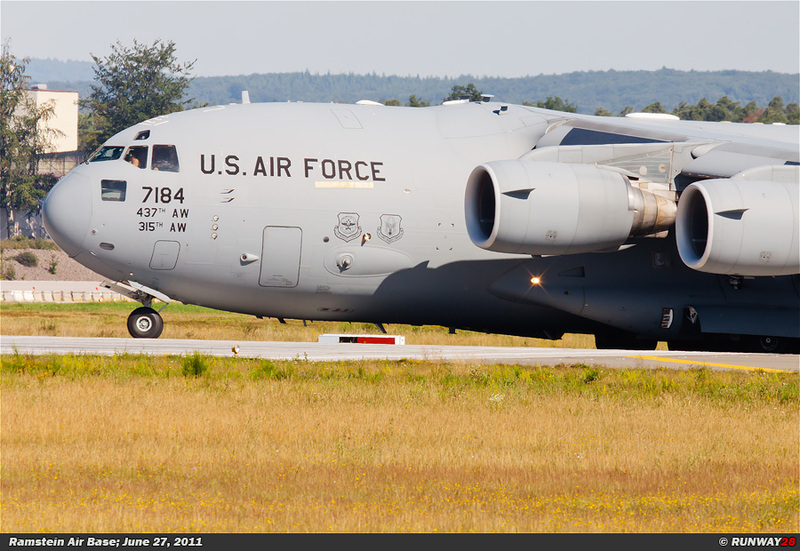 This C-17 was the last plane that I photographed at Ramstein AB. 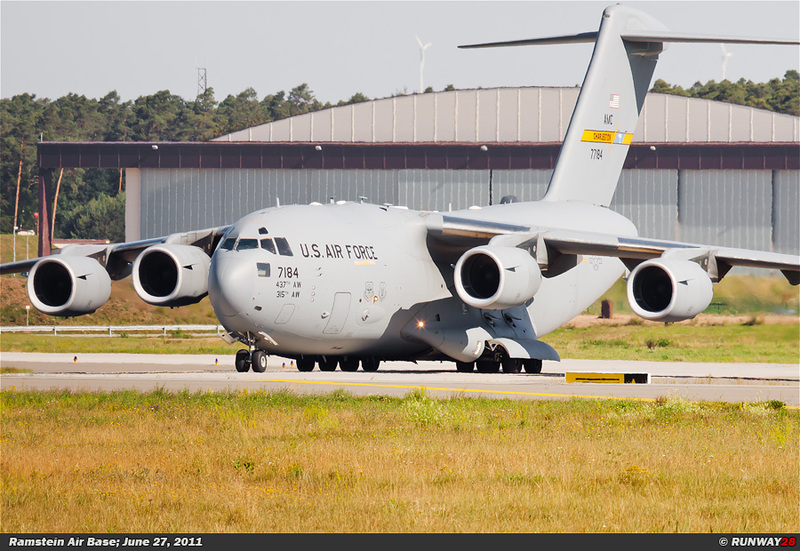 After the departure of the C-17, I left to Manching-Ingolstadt. 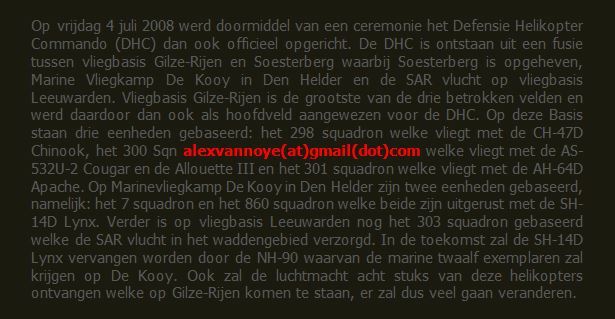 Tomorrow I would look at the aircraft of WTD-61 and EADS. 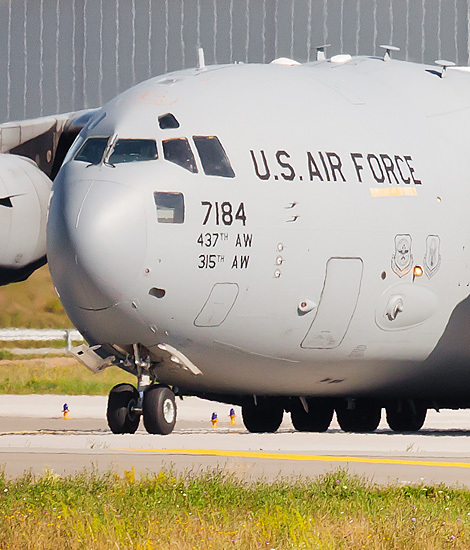 The visit to Ramstein AB was relatively short, but some beautiful aircraft appeared again in front of my lens.